By Springfield - Lady Morgan by Thormanby. The breeding of horses has for centuries been a passion of the people of Ireland. The Emerald Isle was the home of the great stallion Birdcatcher, one of the most influential stallions of the nineteenth century. Given this, it was somewhat surprising that by the end of the nineteenth century, no Irish-bred horse had yet triumphed in the Derby at Epsom. This all changed when the mare Morganette, who had been worthless on the racetrack, was transplanted to the Irish stud of Captain John Gubbins. There, she produced not only an Irish Derby winner, but two colts -- GALTEE MORE and Ard Patrick -- both winners of the English Derby, GALTEE MORE adding even more luster to his Epsom triumph by taking the Two Thousand Guineas and St. Leger as well, to land the British Triple Crown. These sons of Morganette exemplified the great strides which had been made in the development of the Irish Thoroughbred, and later became highly influential stallions for the German breeding industry. Morganette was bred by J.H Houldsworth and foaled in 1884. Though she was described as "mean looking and muley," her pedigree was hard to fault. She was sired by Houldsworth's stallion Springfield and was out of unraced Lady Morgan, a daughter of Derby winner Thormanby. Springfield, a son of the St. Leger-winning Stockwell son St. Albans, was one of the most brilliant sprinters of his era, winning the Fern Hill Stakes, two runnings of the New Biennial Stakes at Ascot, and two runnings of the July Cup. He proved he had more than just one dimension when as a four-year-old, he stretched out to 1-1/4 miles to capture the Champion Stakes at Newmarket over that season's Derby winner Silvio, with Springfield toting 130 pounds to the 118 of the younger classic champion. Springfield was then retired to stud at the Bushey Paddocks, Hampton Court. Springfield's mates throughout his stud career were generally not mares of the highest class, but he did well, getting the Derby winner Sainfoin, One Thousand Guineas victress Briar-root, and the good colt Watercress. On paper, Lady Morgan was one of the better mares sent to Springfield, for in addition to being sired by a Derby winner, she was a half-sister to Marie Stuart, winner of the Oaks, St. Leger, and Coronation Stakes. Second dam of Lady Morgan and Marie Stuart was Oaks winner Miami. Morganette inherited none of the ability of her forebears. Houldsworth tried her on the racecourse only once, in the Prince of Wales's Stakes at Goodwood and she did nothing. She was also found to be a roarer, and was retired. Houldsworth sold her, the price tag being £200 to £600, versions vary as to the amount paid for her by Irish horseman John Gubbins. Gubbins had been partial to steeplechasing, but upon inheriting Knockany Stud, located in the fabled Golden Vale of Limerick, from a brother in 1879, he decided to try his luck at breeding and racing flat runners. Gubbins never lost his fondness for the jumpers, continuing to breed them on a much smaller scale. One of the mares he kept for this purpose was the famous broodmare May Day, who became a close companion of Morganette in the broodmare paddocks at Knockany. Gubbins kept two thoroughbred stallions at his stud, the St. Simon son St. Florian and the Bend Or son Kendal. Gubbins early on bred Morganette to a son of her companion May Day, the half-bred May Boy, who had enjoyed success on both the flat and over fences. The result was the filly ANNETTE, who later produced the winners Quick March and Aria. Bred to Kendal for the first time, Morganette produced another filly, a chestnut named MARIETTA, winner of the Halnaker Stakes and three and a half other races, later the dam of Isalian Beauty. Bred again to Kendal, Morganette produced a strapping colt which was named BLAIRFINDE. This colt was his dam's first classic winner, winning the Irish Derby by twenty lengths. At stud, BLAIRFINDE came up with several good winners, including Dibs, winner of the Ebor Handicap, and Blair Royal, winner of the Irish Oaks. In 1892 and 1893, Morganette produced a dead foal and a colt which was unraced. 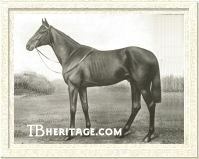 Both were by Kendal, who was also the sire of her 1894 colt, the big bay GALTEE MORE. Morganette's newest colt was named for the highest peak of the Galtee Mountains overlooking the Golden Vale. GALTEE MORE was shipped to the Newmarket yard of trainer Sam Darling and emerged as one of the two best two-year-olds of his generation, the other being Lord Rosebery's Velasquez, a handsome bay half-brother to classic winners Bona Vista and Sir Visto. During his juvenile season, GALTEE MORE captured the Molecomb Stakes at Goodwood, the Rous Plate at Doncaster, and the Middle Park Plate at Newmarket. It was in this latter event that GALTEE MORE and Velasquez met for the first time. Lord Rosebery's colt had taken the New Stakes, July Stakes, the Prince of Wales's Stakes, and the Champagne Stakes prior to his meeting with GALTEE MORE in the Middle Park Plate. Despite his defeat by the Irish colt, Velasquez was considered the champion juvenile colt of the season. GALTEE MORE was easily the second best, his only defeat coming in the Lancashire Breeders Stakes, when he was beaten by the slimmest of margins by Glencally. At three, GALTEE MORE was nearly unbeatable. He took the Two Thousand Guineas in a canter from Velasquez and the rest of the field, romped in the Newmarket Stakes, then easily captured the Derby by two lengths, with Velasquez once again second best. GALTEE MORE went on to Ascot and a victory in the Prince of Wales's Stakes, then to Sandown to take the Sandringham Cup prior to completing his successful bid for the Triple Crown in the St, Leger. GALTEE MORE ended his three-year-old campaign with a victory in the Sandown Park Foal Stakes, and a surprise defeat in the Cambridgeshire Handicap, in which he attempted to win with 9 stone and 6, or 140 pounds, and conceding as much as 48 pounds. Gubbins sold his Triple Crown champion to the Russian government for £21,000. The deal nearly went sour if one takes into account the stories circulated at the time of General Arapoff, prominent in the sale negotiations, exhibiting some exceedingly unseemly behavior. According to one story, he became inebriated after seeing GALTEE MORE canter and rushed off to the house of trainer Sam Darling, spotted a framed picture of GALTEE MORE on the wall and took it. Or later, while dining with Gubbins at Prince's Restaurant in London, made inappropriate advances to many of the female patrons. Gubbins, reportedly incensed by this behavior, called the sale off, but changed his mind after having a night to sleep on it. GALTEE MORE became a successful sire in Russia. His best Russian representative was Irish Lad, winner of the Nagroda Derby, Bolszoj Wsiesojuznyj Priz, and the Gosudaryni Imperatricy in Poland; Karolyi, a full brother to Irish Lad, captured the Nagroda Derby, Nagroda Prezydenta, Rzeczypospolitej, and Gosudaryni in Poland; Galilej, winner of the Gosudaryni Imperatricy in Poland; Galtee Boy, winner of the Nagroda Derby; Galop, winner of the Bolsoj Wsicsojuzny Priz; Hammurabi (not to be confused for the horse of the same name by Gallinule), winner of the Bolsoj Wsicsojuznnyj Priz; and Kassandra, winner of the Magyar St. Leger. In 1904, GALTEE MORE was sold for stud duty in Germany, the German government paying £14,000 for him. He was just as successful in Germany, where he stood at the German stud at Graditz. The best of GALTEE MORE'S German representatives was the colt Fervor, winner of the Grosser Preis von Berlin, Deutsches St. Leger, and Preis von Winterfavoriten. Fervor excelled as a sire, leading the German sire list 1923 through 1926. Seestern and Reseda were each winners of the Kronimus-Rennen; Kreuzer was a winner of the Herzog von Ratibor-Rennen; and The Whip was a winner of the Hamburger Criterium. GALTEE MORE'S most significant German offspring from a breeding standpoint was his daughter Orchidee II. On the racetrack, Orchidee was a classic winner, capturing Germany's Oaks, the Preis der Diana. As a broodmare, she became the dam of German champion Oleander, three time winner of the Grosser Preis von Baden and leading sire in Germany nine times, in 1935 and from 1937 through 1944. Thus, GALTEE MORE was the sire and broodmare sire of two stallions, Fervor and Oleander, which between them led the German sire list thirteen times. GALTEE MORE was also the broodmare sire of Deutscher Stutenpreis winner Gondel; Hamburger Criterium winner Odaliske; and Vysehrad, winner of the Oesterreichisches Derby. GALTEE MORE died on January 30, 1917. The 23-year-old stallion was being shipped to the Union Stud at Hoppegarten. While being loaded aboard the train, he slipped and suffered a broken leg. Morganette's next top class offspring was born in 1899. The previous spring, she was scheduled to be bred to Gubbins's stallion St. Florian, a son of St. Simon which had captured the Duke of York Stakes during his racing career. The horse was suffering from ill health at the time, and thought was given to canceling the mating. Gubbins went ahead with it, and it was fortunate Morganette caught to that cover, for only a week later, the stallion was dead. Morganette's newest son was, like GALTEE MORE, named for a mountain peak, in this instance a peak in the Bruree Mountains. Like his elder half-brother, ARD PATRICK was sent to Newmarket to be trained by Sam Darling. Unlike GALTEE MORE, however,ARD PATRICK was not precocious and needed time to develop as a two-year-old. He did not make his first start until September, in the Imperial Produce Stakes at Kempton Park. Ridden by Danny Maher, Ard Patrick raced very greenly, but his talent carried him through, winning by a neck from Royal Lancer. ARD PATRICK raced more professionally in his next start, the Clearwell Stakes at Newmarket, winning handily. He made only one more start as a juvenile, in the Dewhurst Plate at Newmarket, but he was beaten into third place by Game Chick, the latter coming into the race fresh off beating the brilliant filly Sceptre in the Champagne Stakes at Doncaster. At the beginning of his three-year-old season, ARD PATRICK was still backward, even more so from the autumn, the colt having lost some condition over the winter. His third place finish in the Two Thousand Guineas to Sceptre and Pistol pleased his trainer, Darling happy his colt had run so well against such company when far from his best form. His next start was the May Plate at Kempton Park, in which he finished two lengths behind Royal Ivy while giving 21 pounds to the winner. In his next start, ARD PATRICK won the Newmarket Stakes, run over 1-1/4 miles. It was unfortunate he was disqualified for bumping, but he gained invaluable seasoning from the race, which was to put him in good stead at Epsom for the Derby. He would need it, for the overwhelming favorite was Sceptre, heroine of not only the Two Thousand Guineas, but also the One Thousand Guineas and seemingly in her finest form. Ridden by transplanted American jockey J.H. "Skeets" Martin, ARD PATRICK was away well, kept up near the pace, assumed the lead approaching Tattenham Corner, and drew off to win by three lengths from Rising Glass, with Sceptre only fourth. Restless at the start, she got away tardily, which caused her rider to use her early to make up the lost ground. The ARD PATRICK camp were still celebrating their Derby victory two days later when Sceptre redeemed herself with an easy victory in the Oaks. In his next start, the Prince of Wales's Stakes at Ascot, ARD PATRICK slipped on a wet patch of ground on his way to the start. The incident clearly affected his form, as he lost, but was awarded the race on the disqualification of Cupbearer. ARD PATRICK suffered a severe sprain from this slip, and was confined to walking exercise for weeks. He had to miss the St. Leger, which was won by Sceptre, her fourth classic triumph of the season. Seen under colors again in the Jockey Club Stakes at Newmarket, Ard Patrick finished third to A HREF="Isinglass.html#RisingGlass">Rising Glass and Templemore. The Eclipse Stakes was ARD PATRICK'S primary objective as a four-year-old. He won his prep, the Princess of Wales's Stakes at Newmarket. In the great race itself, he was set to meet Sceptre, as well as that season's Two Thousand Guineas and Derby winner Rock Sand. As it turned out, Rock Sand, who would go on to capture the St. Leger and the Triple Crown, was not a match for ARD PATRICK and Sceptre. These two virtually turned the Eclipse into a match race. With a quarter of a mile left to run in the 1-1/4 mile race, Sceptre seemed to be moving like a winner, but could shake ARD PATRICK, ridden by Otto Madden. The Irish colt's jockey rode his mount brilliantly, saving a final surge for the finish to gallantly defeat the filly by a mere neck. The Eclipse was ARD PATRICK'S's last race. His leg gave him more trouble and he was taken out of training. Gubbins had been negotiating for several months with the Director of the Prussian Government Studs, Count Lehndorff, to sell ARD PATRICK for stud duty in Germany. After the colt's victory in the Princess of Wales's Stakes, the deal was completed, the colt being sold for a price of £20,000. Like his half-brother GALTEE MORE, ARD PATRICK became an excellent sire in Germany. 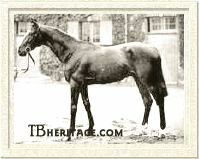 He led the German sire list three times, in 1911, 1913, and 1914. He lived to the age of 24, dying at the German stud at Altefeld in 1923. ARD PATRICK'S best representatives were Ariel, winner of the Deutsches Derby; Letizia, winner of the Preis der Diana; and Dolomit, winner of the Deutschland Preis. Ard Patrick's most important offspring was his daughter Antwort. 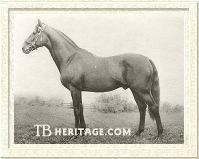 Foaled in 1907 from the Crafton mare Alveole, Antwort was a good stakes winner, capturing the Zukunfts-Rennen. Once put to breeding, she became a tremendous broodmare, producing four German classic winners. Daughter Adresse, by leading German sire Nuage, was a winner of the Preis der Diana and Deutsches St. Leger; Aversion, a full sister to Adresse, captured the Deutsches St. Leger; Abschlus, a colt by Biniou, was another winner of the Deutsches St. Leger; and Alpenrose, another daughter by Nuage, captured the Preis der Diana. Antwort was the second dam of Alchimist, winner of the Deutsches Derby and Grosser Preis von Baden and later two time leader of the German general sire list. His dam was Aversion. The previously mentioned Adresse became the second dam of Abendfrieden, winner of the Deutsches Derby, Deutsches St. Leger, and Magyar St. Leger. ARD PATRICK was an excellent broodmare sire, as ARD PATRICK mares produced Alba and Gibraltar, both winners of the Deutsches Derby; Reichenau, a winner of the Osterreichisches Derby; and Morgan, winner of the Swedish and Danish Derbies. Deutsches Derby winner Herold, out of ARD PATRICK'S daughter Hornisse, was also a winner of the Grosser Preis von Berlin and as a stallion led the German sire list twice. What Morganette's sons GALTEE MORE and ARD PATRICK did for German breeding, her daughters could not for Ireland. None of her daughters became producers of any lasting influence. The exception was her daughter TEMPLE HILL, foaled in 1900, a full sister to GALTEE MORE and BLAIRFINDE. She did have a few noteworthy descendants, namely Eastern Monarch, winner of the Prince of Wales's Stakes, Leicestershire Stakes, and Newmarket St. Leger; Parasang, an American stakes winner of several races, including the Carter Handicap; and Middle Watch, winner in Australia of the AJC St. Leger and VRC St. Leger. 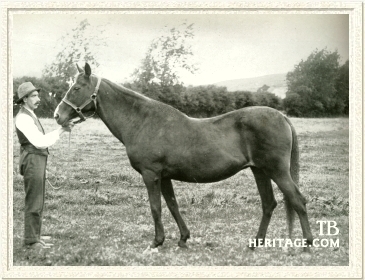 TEMPLE HILL was Morganette's last recorded full Thoroughbred foal. She died in December 1909 at the age of 24. She was buried at Knockany. Her grave is situated next to that of her paddock mate Mayday, the two mares having been virtually inseparable companions. Upon the marker for Morganette, the words 'Immortalised this stud" were etched. Almost an understatement for a mare who not only bolstered the prestige of the Irish Thoroughbred but the German Thoroughbred, as well. MORGANETTE, brown filly 1884 - Family 5 - j.